Left to right, Mike Campbell and Korey Theberge are proud PCC alumni. Years ago, Mike Campbell left Texas for the blue skies of Alaska to be a fisherman. But a funny thing happened along the way: His car broke down on Interstate-5, near Wilsonville. Stuck in Portland, Campbell decided to stay and find work. As luck would have it, he found a job as an industrial maintenance technician where he could apply his knack for fixing things after more than two decades working for a variety of companies, including PepsiCo. “I wasn’t planning to stop in Oregon, but here I am,” he laughed. The established program gives graduates skills to earn jobs or the foundation to pursue advanced degrees. Alumni can get upper-level positions as engineering managers and quality control technicians in some of the Northwest’s most reputable firms like Intel or Biotronik. The EET program and all its options have partial transferability to Oregon Institute of Technology and into many four-year programs. Associate degrees in Biomedical; EET; Mechatronics, Automation and Robotics; Renewable Energy Systems; and Wireless Data Communications. Short-term certificates in EET and Renewable Energy Systems. For Campbell, life as an industrial tech was great until 2008, when he injured his back. Living off of disability insurance payments, he needed to find a new career. Enter Portland Community College. Campbell, a high school dropout, turned to PCC to earn his GED and take three remedial math courses to improve his placement into the college. When he finished, he enrolled in the Electronics Engineering Technology Program. Joining Campbell in PCC’s career-technical program was Korey Theberge. He became fascinated with engineering and technology at a young age when he would take apart his home computers and work on the components. His interest led him to pursue as many engineering labs at Sherwood High School as he could to strengthen his skills. But his family had limited finances, and going to college after high school seemed like a dream. The program at the Sylvania Campus was perfect for Therberge and Campbell. The breadth of courses, industry affiliations, and resources enabled them to begin their careers in an innovative field. They got to put their skills to the test in challenging labs, including EET 242, which showed them how to build and program robots. Campbell, 39, and Theberge, 28, have another thing in common other than being PCC alumni. The two EET graduates are Intel Corp employees. Theberge works in research and development, while Campbell is an employee in the fabrication unit. 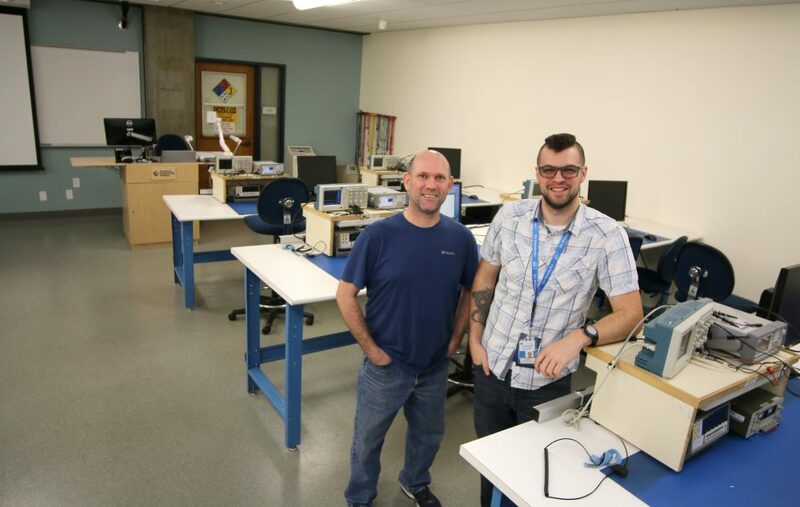 Together they collaborate to help produce Intel’s latest technology and products, and are PCC’s best examples of the jobs graduates can get once they’ve completed the program. 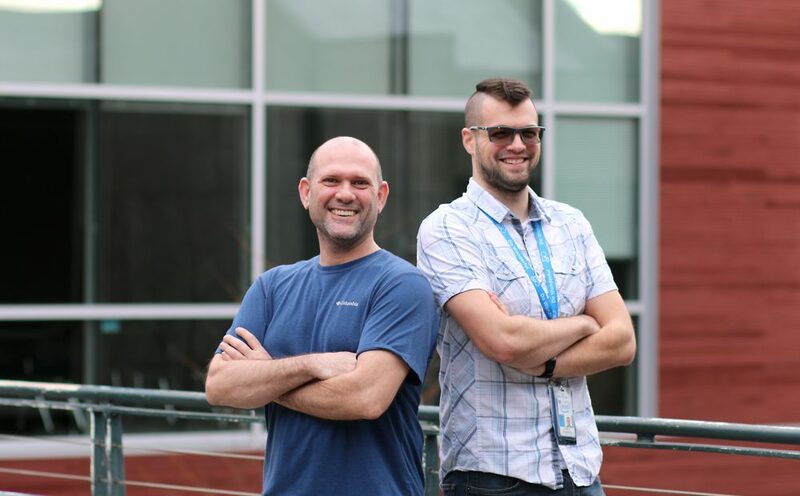 Their success with Intel is a big reason why these two alumni give back, with both being very involved with the company’s volunteer program. Each term, Theberge and Campbell assist EET students after work, during the evening labs. They also advise the college’s STEAM student club and assist participants in the nearby campus Maker Lab. And Theberge makes time to serve on the program’s industry advisory committee with Foster. PCC and the state’s community colleges are advocating for a 2019-21 biennium budget of $787 million to bolster student support and career-technical programs like EET. Within that funding, $70 million will double the number of CTE graduates in Oregon by 7,900 every year. In the meantime, the EET program continues to shine brightly, highly valued by several local companies that boast some of the best career opportunities in the region. 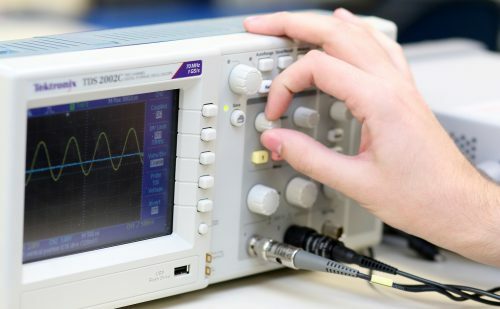 Starting salaries in the electronic engineering field range from $50,000-$70,000, according to the Oregon Employment Department. There are 3 comment for this article. If you see something that doesn't belong, please click the x and report it. Congratulations to both of these exemplary students! Way to go Korey and Mike! Companies like Intel are always in need for EET. Congrats! I too completed the EET program and landed at Intel just after completion. Great program and I highly recommend!